Hallo meine Freunde! Today it's all about the contents of my Luftpost package - specifically, two newly arrived Bavarian beauties from Wollmeise. Naturally the 4-ply superwash wool is soft, but that is not what makes Wollmeise so special. Each 380 yd. 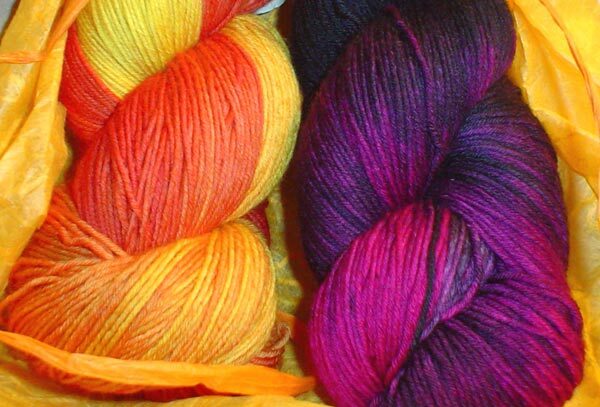 (350 m) skein is available in nearly 40 different shades. Consider too that you can vary the intensity of that color (bright, medium or dark) and you've got hundreds of customizable possibilities. Toss in Wollmeise owner and dyer Claudia's one-on-one customer service and you've got a winning proposition. At 13 Euro each plus 8 Euro shipping for 1 - 2 skeins, these unique hand-dyed yarns are worthy additions to your collection. Is your German a bit rusty? Click on the link near the bottom, right labeled 'englisch'. Once you've decided on which color and type of yarn you want (they offer sock, worsted and baby aka lace weight), click 'contact' to send Claudia an email with your request. By the way, a selection of Wollmeise yarns will soon be available in North America through The Loopy Ewe if you don't want to navigate the Wollmeise website. In knitting news, I stuck a pin in the map and have set a goal of finishing mates for 2 single socks over the next couple of weeks. After that, Forest Canopy bobs back up to the top. This time, I made note of the last pattern row so as not to repeat The Dance of the Stitches once I resume. That's some lovely yarn. Glad you're going more sedately with the Forest Canopy Shawl! 13 Euro?? Gott im Himmel!! OK, we've now exhausted MY German vocabulary... those are some lovely lovelies you've got there... I'm sure you'll let me give 'em a squeeze when I get there, no? The jealousy in this room is palpable. I've been eyeing that campari-orange on the site....must wait....must wait until my budget recovers from the flock and fiber fest that I went to. I do not need more sock yarn. You are simply killing me. Oh wow, some lovely knitting and purchasing going on there. How beautiful! But, alas, with the moving comint up in two weeks no purchases are allowed. Although after that, all bets are off. SAWEET! I finally can show my mother-in-law exactly what she can bring me for Christmas. 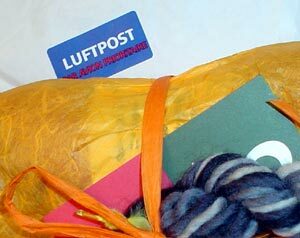 Forget the marzipan cookies - gimmie some of that wool! i love your post. monica and i just purchased that yarn also. i need to post mine. you picked lovely colors. gorgeous yarn. but really, i do not need more yarn. do. not. need. haha. who am i kidding? Wow, that yarn is pretty! I especially like the poison. I'm on a sock yarn diet for a while, but I shall keep the Wollmeise in mind. Sounds like you have a great plan for getting things knit without angst. Those are gorgeous - I love the Campari colorway. each is different but equally gorgeous! they look like 100 percent natural fiber - are they? oh seriously... I did not need to see this. beautiful colorways, and shopping in German? who can resist. That yarn is so beautiful...I love it! !